While exercise is generally advocated to contribute to overall well-being, it comes with a health risk, both for the individual, as for society as a whole. The body parts that are most often affected by an injury are the knee and the ankle, with respectively 970.000 and 680.000 injuries in the Netherlands alone. The single most common injury is an ankle sprain, which makes up 85% of all ankle injuries. In addition to societal costs, there is extensive evidence that there is an up to twofold increased risk for ankle re-injury during the first-year post-injury. In about 50% of all cases recurrences may result in disability, can lead to chronic pain or instability and may require prolonged medical care. As such, ankle sprains pose a significant burden to the individual athlete and to society. Previous research has shown that both externally applied ankle supports (i.e. taping or bracing), as well as neuromuscular training programs are successful in preventing recurrent cases of ankle sprain, both from an effectiveness, as well as a cost-effectiveness perspective. These measures can reduce the increased risk of recurrent injury to the same level as never injured athletes. However, although the neuromuscular program has been proven (cost-)effective compliance with the program is poor. The aim of this thesis is to evaluate the implementation value of the ‘Versterk je Enkel’ App as compared to the usual practice of providing injured athletes with ‘ordinary’ materials. 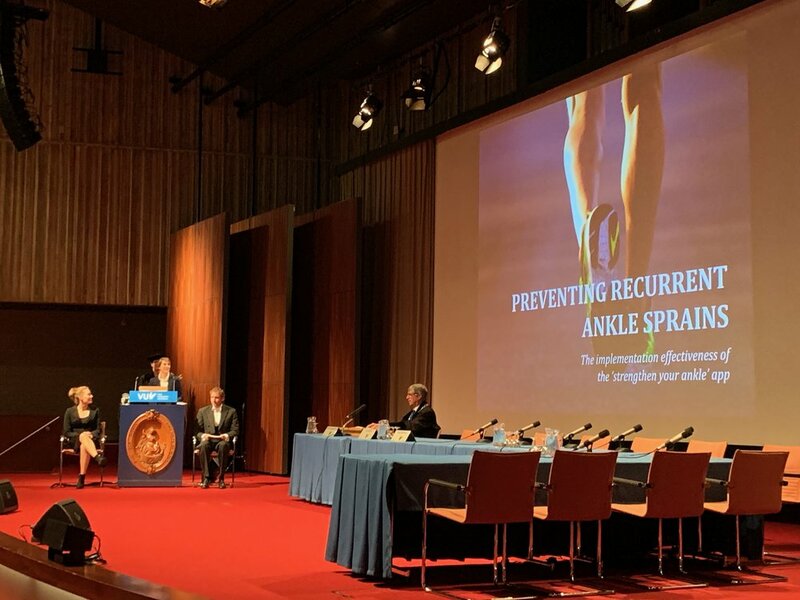 The premise is that use of the ‘Versterk je Enkel’ App would increase compliance to the prescribed program and, consequently, would decrease ankle sprain recurrence incidence. Chapter 2 describes the study design of the ‘Verstek je Enkel’ research line that is the foundation for this thesis. It explains in detail how the participants have been recruited and how the flow of athlete recruitment was executed. Chapter 2 also provides details on the ‘Versterk je Enkel’ program with visual examples of the included exercises and graded schedule. van Reijen M, Vriend II, Zuidema V, van Mechelen W, Verhagen E. The implementation effectiveness of the “Strengthen your ankle” smartphone application for the prevention of ankle sprains: design of a randomized controlled trial. BMC Musculoskeletal Disorders. 2014 Jan 7;15(1):2. An important part of this thesis deals with the concept of compliance. Chapter 3 shows the results of extended review on sport injury intervention studies. It shows how compliance is defined, measured and dealt with in 100 RCT’s. It was shown that assuming an entire study population complies with the prescribed intervention could lead to erroneous conclusions. To further complicate matters, many different definitions of compliance are used and although compliance and adherence are not synonymous, these constructs are being used interchangeably to describe the complete and correct following of a prescribed intervention. While the majority of included studies in the review, do mention the concept of compliance, only one-fifth of the studies gave a more detailed account of how compliance rates influenced their study results. The studies that did account for compliance demonstrated that the level of compliance could have a significant effect on study outcomes. van Reijen M, Vriend II, van Mechelen W, Finch CF, Verhagen E. Compliance with Sport Injury Prevention Interventions in Randomised Controlled Trials: A Systematic Review. Sports Med. 2016 Aug;46(8):1125–39. Chapter 4 presents the results from the short-term study. It compared the compliance rates of the intervention program from App users with those using a printed Booklet. Participants were asked weekly about their compliance with the ‘Versterk je Enkel’ program and about the recurrence of self-reported ankle injury. It was shown that using an App versus a Booklet, did not lead to significant different mean overall compliance rates. Additionally, the percentage of participants that was highly compliant – i.e. those following at least 70% of the program, the arbitrary threshold necessary for the program to be efficacious - was not different between groups. The mean compliance to the exercise scheme was 73.3% (95% CI: 67.7-78.1) in the App group, compared to 76.7% (95% CI: 71.9-82.3) in the Booklet group. Additionally, the incidence densities of self-reported time-loss recurrences were not significantly different between both groups (HR 3.07; 95% CI 0.62-15.20). van Reijen M, Vriend II, Zuidema V, van Mechelen W, Verhagen E. Increasing compliance with neuromuscular training to prevent ankle sprain in sport: does the “Strengthen your ankle” mobile App make a difference? A randomised controlled trial. Br J Sports Med. 2016 Oct;50(19):1200–5. After the intervention program that lasted for 8 weeks, participants were followed-up for another 10 months. They were asked to complete online questionnaire monthly to examine re-injury and to register any residual functional disability or pain. After the total time frame of 12 months, there were no differences in injury incidence rates (HR 1.06; 95% CI 0.76- 1.49) nor differences in residual functional disability or pain. It was concluded that when the participant is compliant with the program, both methods showed similar effectiveness in reducing the risk of recurrent ankle sprains, on both the short and the long term. van Reijen M, Vriend II, Zuidema V, van Mechelen W, Verhagen E. The “Strengthen your ankle” program to prevent recurrent injuries: A randomized controlled trial aimed at long-term effectiveness. J Sci Med Sport. 2017 Jun;20(6):549–54. Chapter 6 – Which program is more cost-effective? Primary outcome measures of Chapter 6 were the incidence density of ankle injury and the incremental cost-effectiveness ratio (ICER) during 12 months follow-up. During follow-up 31 athletes suffered from a recurrent ankle sprain that led to costs resulting in a Hazard Ratio of 1.13 (95% CI: 0.56-2.27). The incremental cost-effectiveness ratio (ICER) of the App group in comparison with the Booklet group was €-361.52. The CE plane presented in chapter 6 shows that there was neither a difference in effects nor in costs between both intervention methods. van Reijen M, Vriend II, van Mechelen W, Verhagen E. Preventing recurrent ankle sprains: Is the use of an App more cost-effective than a printed Booklet? Results of a RCT. Scand J Med Sci Sports. 1st ed. 2018 Feb;28(2):641–8. To evaluate the ‘Versterk je Enkel’ NMT program we used the RE-AIM framework as a reporting template. We looked at the implementation and maintenance phase to identify the barriers and facilitators as experienced by the final users. Semi-structured and online questionnaires showed that there was no significant difference in perceived simplicity, usefulness and liking of the exercise during the eight weeks of the NMT program. 14/16 participants from the interviews agreed that an App would be of additional benefit over a Booklet. After twelve months’ follow-up, when asked how they evaluated the overall use of the App or the Booklet, users of the App gave a mean score of (mean ± sd) 7.7±0.99 versus a mean score of 7.1±1.23 for the users of the Booklet. This difference in mean score was significant (p=0.006). van Reijen M, Asscheman M, Vriend II, van Mechelen W, Verhagen E. Users' Perspectives, Opportunities, and Barriers of the Strengthen Your Ankle App for Evidence-Based Ankle Sprain Prevention: Mixed-Methods Process Evaluation for a Randomized Controlled Trial. JMIR Rehabil Assist Technol. JMIR Publications Inc., Toronto, Canada; 2018 Jul 6;5(2):e13. We found that the method of implementing the ‘Versterk je Enkel’ NMT program did neither lead to different rates of compliance nor to differences in (cost-)effectiveness. Both in the short and long term, rates of re-current ankle sprain were similar when using the App or the Booklet, and compliance with the program did not differ between both methods during the 8 weeks of the intervention. The semi-structured interviews and our thorough analysis of compliance and (cost-)effectiveness showed us that there is no such thing as THE (injured) athlete with set determinants of behaviour. Each of the 220 participants had its own story on how the first ankle sprain arose, if and how it was treated and how the individual went about preventing (or not) re-injury. During both the short and the long term, each of the participants had to find the time, the motivation and the resources to do so. Some succeeded, some did not and some only to a certain extent. It became clear that not all participants preferred the use of the mobile app. This led us to conclude that traditional methods of delivery should not be forgotten and if possible, should co-exist with more innovative, - mobile - options. With multiple options, the diversity in individual limitations and barriers can be acknowledged. Our advice for the individual athlete and stakeholders involved would therefore be to use the method that is preferred by the athlete. This can be the App, the Booklet or even a combination of both, such that the athlete can choose the method of implementation that is most easily accessible at a certain moment of time. Our main message is that the programis effective but should be executed.